Press brake is the main industrial machine to perform the technological operations as plate and sheet metal bending. 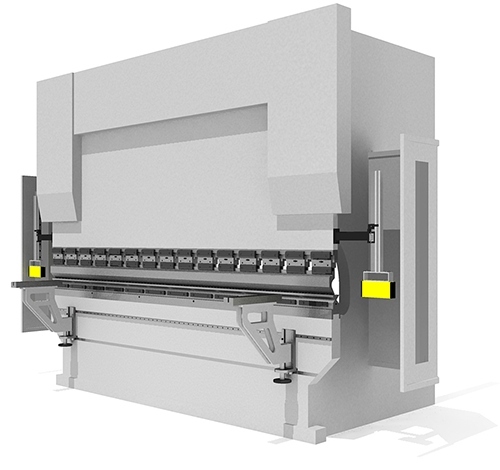 Today, in sheet metal industry the stand-alone press brake is the general unit for bending of pre-fabricated parts (after cut or punching) to make the shape of the final product. If we are talking about the typical sheet metal workshop before press brake there are cutting operations (cutting with laser, waterjet or lasma cutting machine or punching with punching press) and after are operations to finalize the final product as welding, painting and assembly operations. Press brake machine is known in industry more than 70 years and press brake bending technology in general is the same with the new achievements of precision, quality and control. In the market usually the construction of press brake is known as C-frame construction which could be explained as following: 2 shoulder side plates with the table (the term “bed” as also used”) between them, the beam or traverse as the moveable unit to add the force and to perform the bend, power unit which is responsible to initiate the force, press brake tools installed according to the bending task, backgauge for part positioning operations and the units for control of movements and positioning. Wikipedia and other sources provide a lot of general mixed information about press brakes but we would like to make more theoretical article about types according to the way of working and possibilities. Anyway our classification is not official and could be used widely by different manufacturers to provide their own specifications. Compact (small machines with the length of bending up to 1200-1500 mm) usually for small parts, low tonnage and small dimensions to install in workshop. Typical standard machines from 1500 up to 6000 mm with different tonnage. Big machines usually with high tonnage and big length applications from 6000 till 12 meters or more. In addition it is necessary to tell that this terminology used to identify only the power unit for force and beam movement but not the movement of the backgauge which is usually manual or servo-electric in all the ways. Upstroke (the stroke is performed by the beam on top side – the standard concept for all main machines worldwide, the table is idle and non-moveable). Downstroke (the non-moveable top side of the machine and the table is moving towards to the upper beam. This configuration is very rare, we know only one low-tonnage machines active manufacturer with this concept). Press brakes with Promecam – Euro system (all manufacturers from Europe, mainly Asia, North and South America). Press brakes with American style system (the main system for North America). Press brakes with Trumpf-WILA or LVD similar system (with safety- or quick- clicks and buttons). Press brakes with LVD- old system; Beyeler-Bystronic , Colgar, EHT, Colly-Ajial, Durmazlar, country-specified machines etc. (clamping systems specified and used by the specific manufacturers). Tandem (two standard or non-standard machines installed together with the synchronization of the movement to achieve the total bending length for 2 machines). Tridem (as tandem but 3 machines installed together). Standard as the standard opening / daylight planned for manufacturer. Extended opening for bigger daylight and extended stroke for deep applications. Manual completely with handy or hand wheel regulations and adjustments. The bending and movement usually performed by hand lever. Semi-automatic as NC or simple controller machines. For example the movement of X-axis could be controlled in display but only this movement, simple adjustments for press brake stroke and finally only beam approach and the backgauge approach movements for control. CNC controlled machines with installed computer numerical control and possibility of interfaces for programming, program storages, various cycles, control of more than 2 axis and auxiliary units control, simulation possibilities etc. Stand-alone machine as one single unit. Robotic cell which means to replace the operator with the robot to load and unload parts and move according to the necessary positioning. Complex automation systems with robots or other devices to perform not only the movements of part but also to change the press brake in automatic mode if necessary and connected with automatic tooling storages systems. Automatic systems with gantry-type systems (the same as robot but the other concept of automation). CE-certified with laser or light guards. CE-certified with low working speed without the additional safety devices.